Let's be honest: if Castle Grayskull were eligible to compete in this competition, it would automatically win. It's an unstoppable juggernaut and allowing it to battle for a place on my list would be like inviting the Harlem Globetrotters to compete against your church's peewee basketball team- lots of fun to watch but ultimately pretty unfair. That being said, 2013 saw the release of a mother flippin' MOTUC Castle Grayskull. End of story. The rest of the countdown is after the break. While I love the design aesthetic of MOTUC figures sharing so many parts, it's always refreshing to see a character that's extremely unique. Lord Dactus is one of those unique looking characters. While his look does highlight his roots in the Mike Young Productions animated series, it also gives him a fantastically detailed and modern appearance. With massive wings, great armor, and a fantastic sword, Lord Dactus is an excellent addition to the Heroic Warriors. 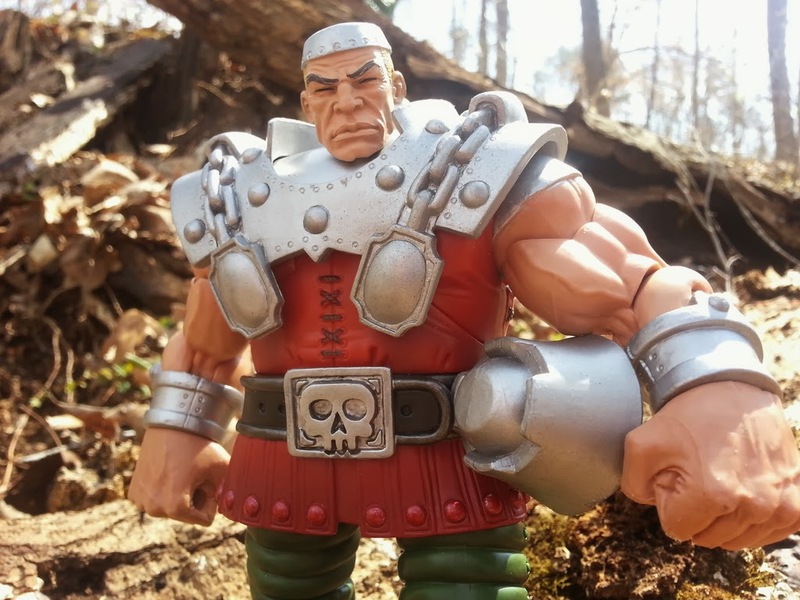 No action figure this year inspired me more to try my hand at storytelling than King He-Man. From his various scars and wounds to his damaged and worn sword, everything about this figure just hinted at stories waiting to be told of He-Man's journey from a young warrior and protector to an old, wise king. I'm a huge She-Ra fan but it's no secret that many of the Princess of Power releases have been flawed in some way. Not Castaspella here. She has a unique and colorful appearance, a gorgeous head sculpt, a cool nod to her vintage toy with the wheel on her back, and a great magical blast effect. There were a few good female figures this year, but only Castaspella made it onto my top ten list. Snake Face was a vintage figure I never owned as a child and have never picked up during my collecting endeavors, so it was quite exciting to get this updated version. 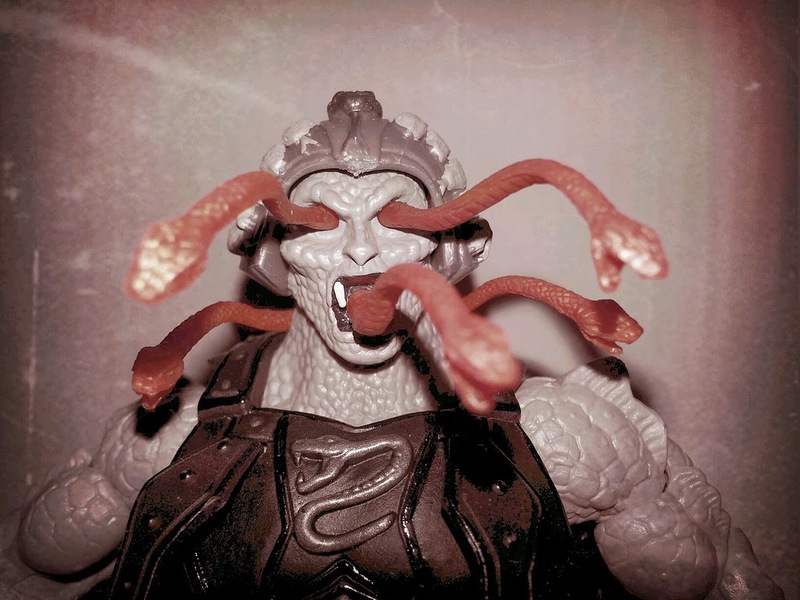 A great addition to the Snake Men, Snake Face came loaded with accessories and the ability to replicate his vintage action feature through an alternate head and detachable plastic snakes. Mattel surprised us with another out of this world and nearly completely new figure with Mantenna. While the vintage figure sculpted Mantenna's four seperate legs together as only two separate legs, the MOTUC Mantenna has four seperate legs. Oh, and interchangeable eyes. He's really an amazing figure, even though he doesn't have bloodshot eyes. Since these two guys are essentially the same figure with only a simple paint difference, they're both getting included here. Mattel nailed these guys. Unique sculpts, loads of cool new accessories, and packing them two to a set really made for an item that everyone wanted. These guys sold out faster than anything else from MOTUC that I can remember in recent memory. If there is one MOTUC toy from 2013 I find myself picking up and playing with more than anyother, it's Sky High and the Jet Sled. I'm operating under the assumption that the Jet Sled is an accessory for Sky High and if that's the case, it's the most amazing ever. I really like the figure himself, but the Jet Sled is truly a thing of beauty. Both the Wind Raider and the Jet Sled have been som amazing that it's a shame more MOTUC vehicles haven't been made. Two He-Man figures on my top ten list? I know, I'm kind of surprised as well but let's be honest- He-Man figures just usually turn out really well. Galactic Protector is an incredibly unique interpretation of the most powerful man in the universe and a great addition to the New Adventures roster. Not only does he include the armor, harness, and an alternate head for two unique looks but he has great weapons and enhanced hand articulation. Bring on NA Skeletor, She-Ra, and Teela! Not only was Ram Man the first true action figure review I wrote for The Epic Review, but he is also the figure I believed would take the top spot for most of the year. He's just... perfect. He's exactly what I wanted from my Ram Man figure in MOTUC and was a figure that if he hadn't been made, I would have been crushed. While I really want characters like Rio-Blast, Queen Angella, and Gwildor, with Ram Man on my shelf everything just feels like gravy. Except for Imp. 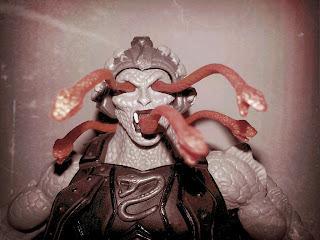 Mattel must make Imp. I'll be crushed if Imp never materializes in the line. Fang Man was my favorite figure released this year. I'm not the biggest Filmation fan in the world. I have never clamored for a Fang Man figure in my life (the guy only appeared one time). But you know what? This figure is amazingly well done. 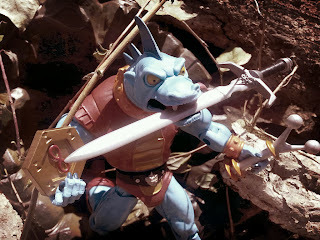 From the cool articulated tongue to the three artifacts/ weapons directly from the Filmation cartoon, Fang Man is a winner. I love his color scheme and his unique appearanceachieved through his extra neck piece and his "hunchbacked" outfit. He's just a fun and brilliant example of what MOTUC is capable of when it's firing on all cylinders. And there were many times when I felt like the line was firing on all cylinders this year. I was actually looking forward to Strongarm, but when I got him in hand he just kind of bored me. I love his teleportation ray and the swappable arm, but I think the head sculpt is a bit weak. I have no ill will towards Dawg-O-Tor, it's just that he's a bit plain. MOTU is filled with bizarre humans and creatures, so it's tough to stand out. It's probably not you, Dawg-O-Tor, it's probably me. Standor is actually the only MOTUC figure I didn't buy this year, and that's just because he's so dull and has a very caricatured Stan Lee face. While the body and helmet are kind of cool, the head sculpt just kills it for me. 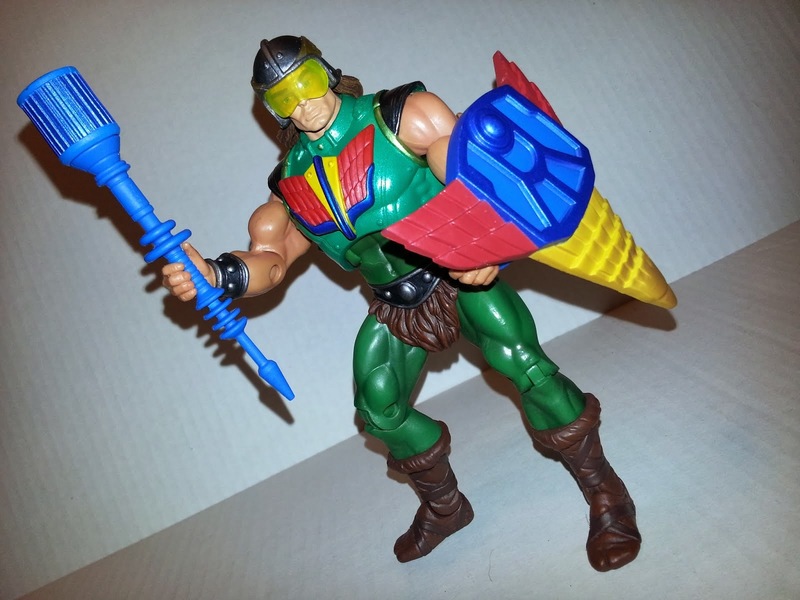 Throw in the fact that he doesn't include any accessories and you have an easily skippable exclusive for anyone except diehard Stan Lee fans (BTW, Stan Lee has absolutely nothing to do with MOTU). Here's another figure that has no technical flaws (decent paint, good articulation, good quality control), but suffers from the one two punch of being an unimportant character and a boring figure. For being a bad guy, nothing about him really looks evil. He's duller than mummy dust. I don't dislike this figure, but it's simply a clear red Hordak with fewer accessories. It was also sold in the most obnoxious way possible. Not only did you have to be on line at the right times, but Mattel neither announced that the figure would be coming nor did they release him on a sale day so that you could add him to an already planned shippment. Yup, basically Mattel just got us to pay extra over-inflated shipping costs. I hope nothing like this comes back next year. 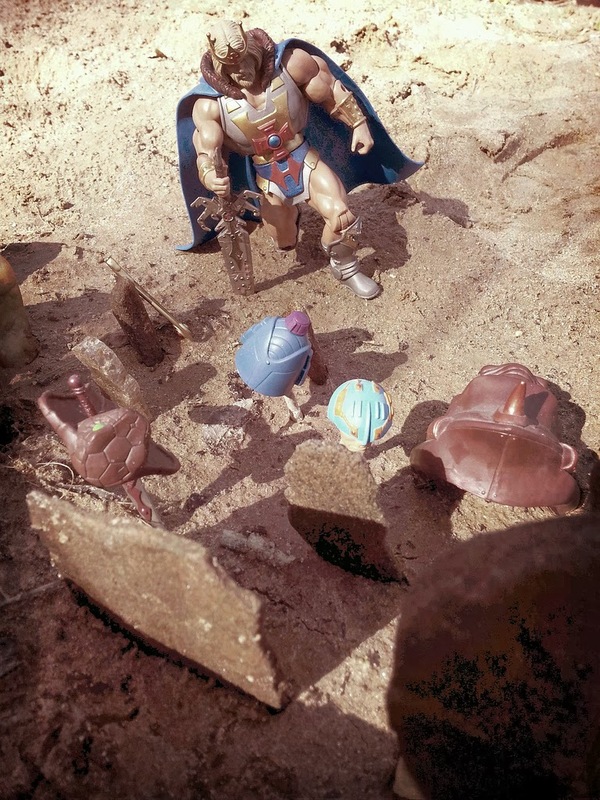 Happy New Years MOTUC fans!  Let's hope that 2014 is as fantastic of a year as 2013 was for this toyline! Sadly the only figure i have off this list at the moment is Galactic Protector He-Man but hey the year is early right? lol. Love Fang-Man and Strong-Or and Ram-Man is pretty awesome too much better than i thought he would turn out for sure. Nepthu and Spirit of Hordak are pretty lack lust and rank perfectly on your list am curious on when we will be getting Rio Blast and i want to see maybe the line extending to maybe make a DC Comics Warlord which would be incredible to see. Since we're getting Extendar this year, I have the feeling that Rio-Blast will be a 2015 sub draw. I know I'd sub, know questions asked, if it meant getting Rio Blast. I've always loved that guy!